Am I warm, and home, and safe. And all the dark hours. I have been saying some variation on this prayer for a long time. It is ever-changing, sometimes shorter, sometimes longer. Every morning I light my hearth candle. I am the flame keeper for this home, and last year, when I received a consecrated wick from a friend in Ireland, lit from Brigid’s everlasting flame at Kildare, I began to use it for my morning devotion, and adapted my morning prayer to include it. I was at first concerned as to how this worked? My friend could not send me fire from Ireland, so . . . ? And then it was explained to me that if the wick was lit in ceremony at the fire of Brigid, then it could be passed on, and on. 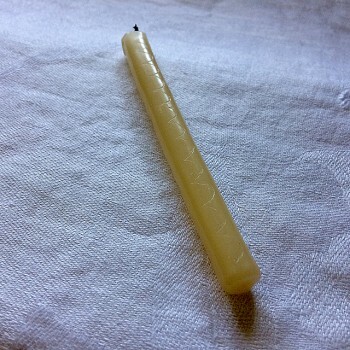 When she sent it to me, it was a birthday candle that became rather crushed in the mail, but the wick was intact, so I used it to dedicate one of my own candles, which I then marked to remind myself of its special use. It’s short now, and will be rededicated soon, perhaps during this Brigidtide. 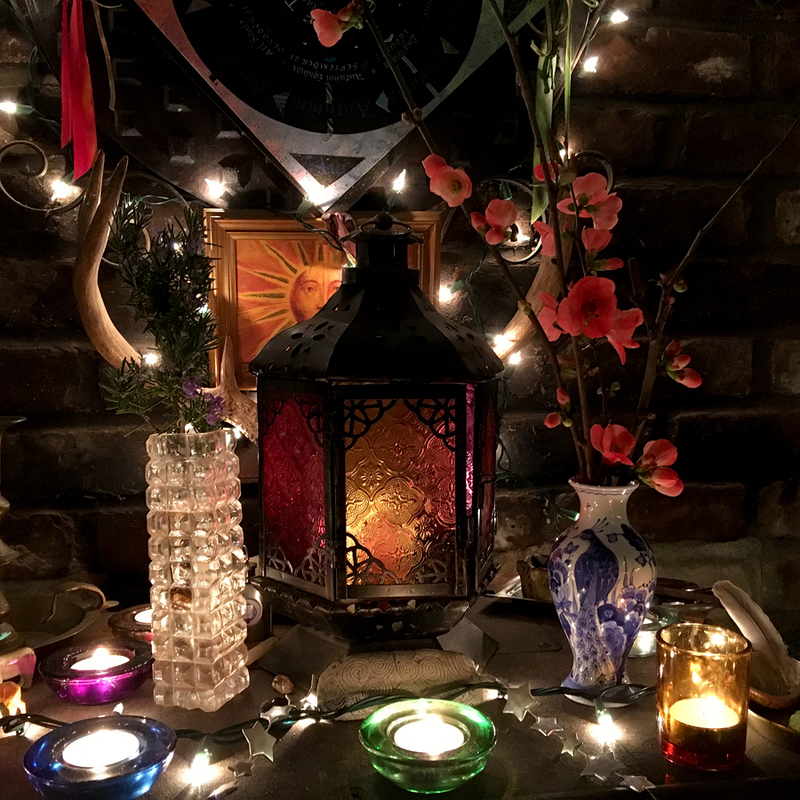 I am most comfortable celebrating this festival over three days, beginning at dusk on January 31st, Brigid Eve, and continuing on to dusk on February 2, Candlemas. As a friend pointed out, of course I would want to celebrate for a while, for Brigid is many things to me, first as an artist and scribe, then as a healer, for which I’ve often called on her, then as a smith, which is not my art but I have the work of other magicians of metal in my body, and finally as an earthing goddess, keeping me and my beloveds safe. And Brigid’s lore is rich with even more; she is said to have been the first to keen her mourning when her son was killed in battle, so I often think of her when I am in the depths of grief. She is a solar goddess and weather worker, and a bridge between seasons, and even between spiritual traditions, being celebrated as both goddess and saint. I have loved and flirted with many goddesses from many cultures, for I love all the faces of the feminine divine, but I always seem to come home to Brigid. 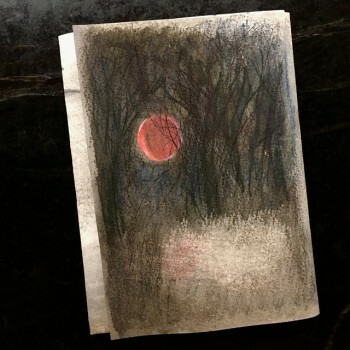 This year, I began even earlier, rising before dawn on Brigid Eve to see the lunar eclipse. 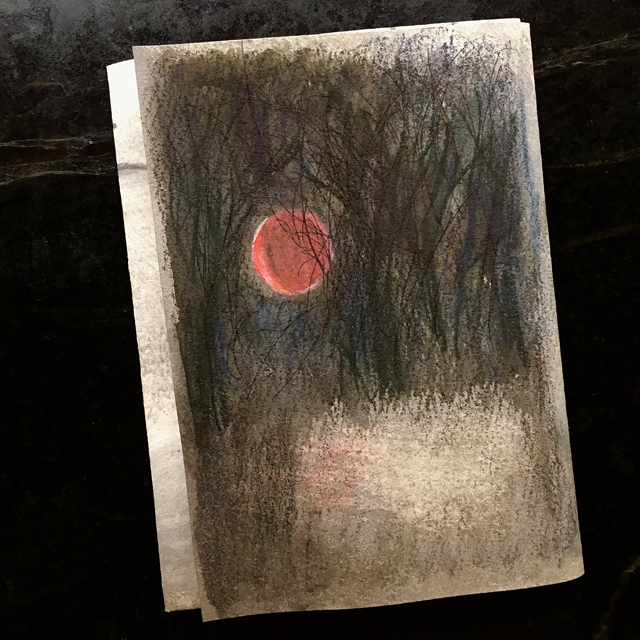 The moon in her blood-colored cloak was setting in the west and quickly gone from sight, but I saw her, and roamed the neighborhood to find her again through the trees. All of my photo attempts failed so I returned to the old way, pre-camera, capturing it with a drawing on a journal page. This way I could play with the image, using the lighter part of the existing ground to imagine the moon’s light reflecting on the water in the creek – not something I saw this time, but have many times before when the moon is full, glimpses of light through the trees. And now, I am away, having completed my devotional here, sharing the celebration with all of you. As they say in the old country, Beannachái na Féile Bhríde! Brightest Blessings of St. Brigid’s Day! So beautiful, and good to know there are people like you starting their days early and with loving care. Your words are so very heartfelt. Thank you for sharing your way of recognizing the beauty & honoring of Brigid. She is my patron and yours the most beautiful, lovely and poignant of recognitions, humility & awe. Thank you, Cari, for this wonderful prayer and your heartfelt words. Your altar is so beautiful as is your poetry. Thank you for the inspiration. I love how each of the elements is honoured here. So often Brigid is revered in Her fire aspect and for the sacred water associations. But the older I get and my devotion deepens our relaionship I see the relevance of all the elements. She may be a triple goddess but I also love the quadruplicity as each season unfolds and she shows her face in yet another elemental – and essential – way. Loved this prayer, as it prompted my own. Thank you as always, for this beautiful inspiration.